TORONTO -- The NDP has launched a new website which it says will help voters calculate how much they could save under a New Democrat government. The online tool -- called the NDP Savings Calculator -- is based on party pledges that include taking the provincial portion of the HST off hydro bills, cutting auto insurance rates by 15 per cent and freezing the cost of post-secondary tuition. NDP Leader Andrea Horwath says the site was put together because the New Democrats were the only party talking about how "Ontarians are finding it tough to make ends meet." She says the NDP plan "respects your tax dollars but also makes life more affordable." 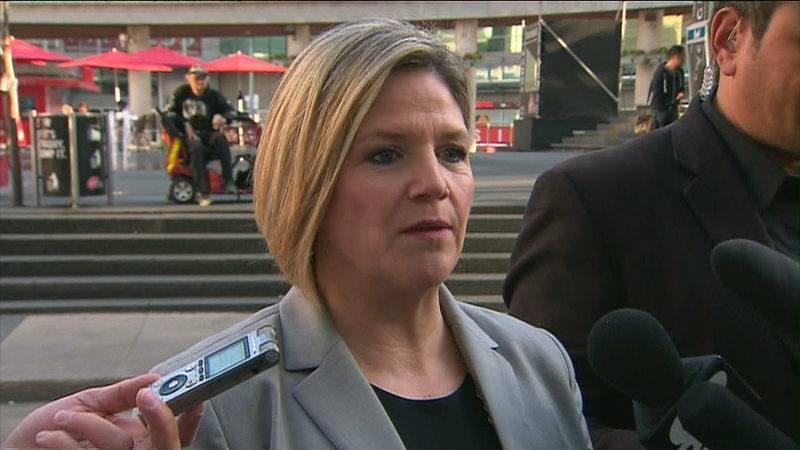 Horwath unveiled the new tool in Toronto a day ahead of the televised leader's debate, which she says will help voters get a real sense of what each party has to offer. Horwath, who is originally from Hamilton, says she's not afraid to bring out the tougher "Steeltown Scrapper" side of her personality in the debate if necessary. "The debate is going to be an interesting opportunity for all of the leaders to not only bring our ideas forward but to interact and that's certainly something I'm looking forward to," she said. "It is a very important election on June 12 because people can make a decision for a positive future with great ideas that make life more affordable for them and meet their priorities, or they can go back to what they've already had or they can look to (Progressive Conservative Leader Tim) Hudak who frankly hasn't made much sense." NDP Leader Andrea Horwath speaks to reporters while unveiling her party's new "savings calculator" in Toronto on Monday, June 2, 2014.